Sunshine, wind at our backs and gentle hills… That was the mental picture I had of our last day into St. John’s. Sometimes reality and our hopes do not line up! The ride was in a mix if clouds, rain and sometimes gusting gale force winds. Hill and more hills also keep us working hard to reach our goal. We have a new description of Newfoundland, the land of 10,000 hills. 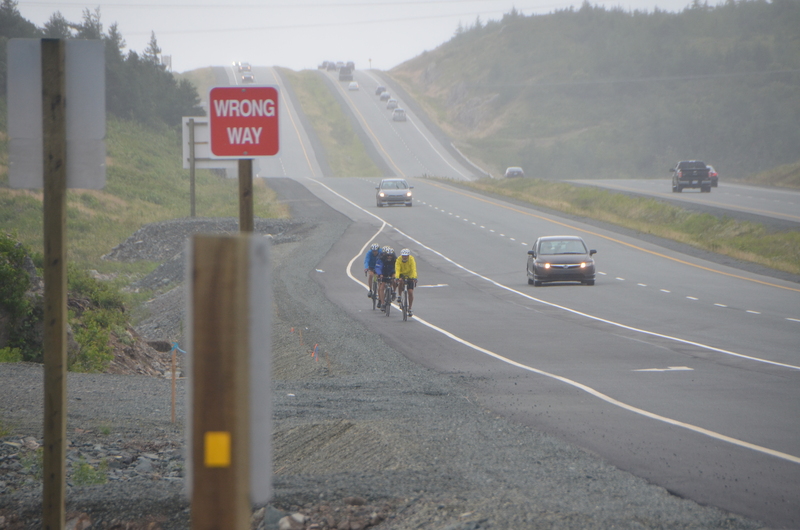 Cycling across Newfoundland is not for the faint of heart! About 30 minutes into our ride I had yet another flat tire bringing my total to 7 for the trip. Timo made the trek with no flats! Shortly after coffee break Rob lost his phone somewhere on the road. He road back to see if he could locate it. No luck. Jacquie had lunch ready for us with a few guest. Her mother came out from Manitoba to celebrate. 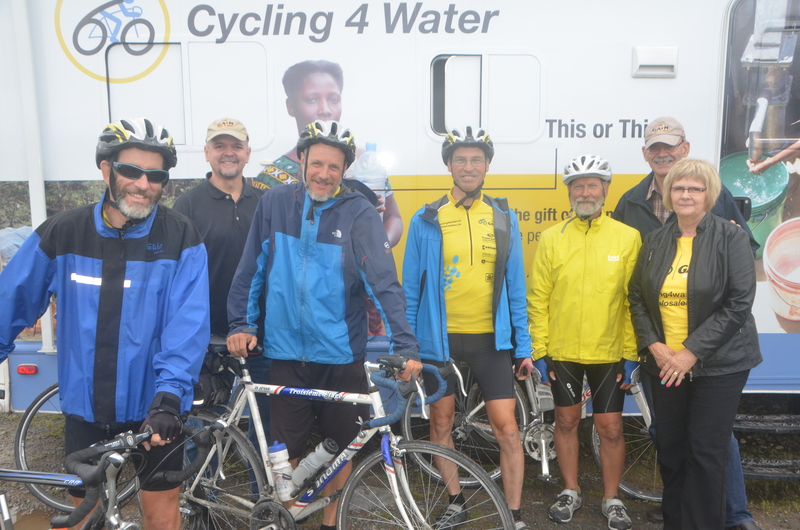 Bill Blaney, the director of Global Aid Network and Peter Koteles also from Gain also joined us. Bill took Rob back to the area where he lost his phone. Using a computer GPS and “find my iPhone” app he found his phone. Amazing! 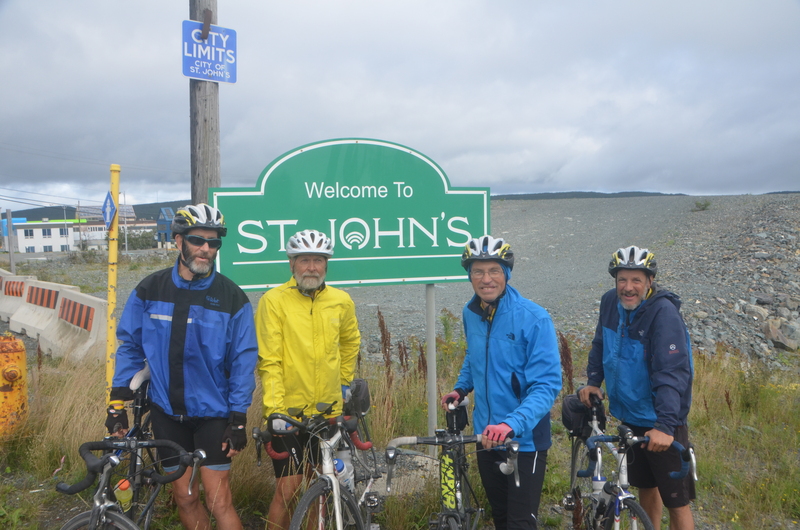 Our last 45 km into St. John’s had to be the one of the most difficult of the whole trip. 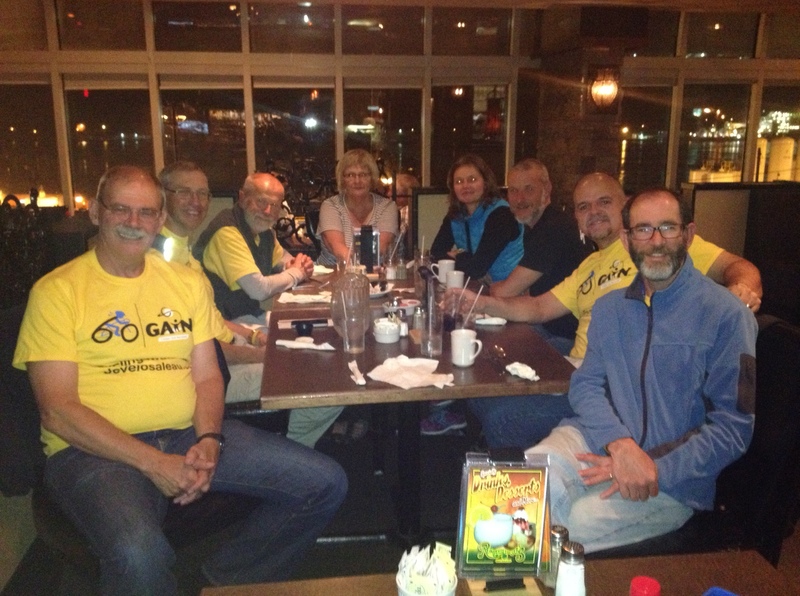 Hills, rain and severe cross and head winds made this last leg a hard fought battle against the elements. There were moments that I wondered if we would be blown off the road. The good news was once we got to St. John’s it was all downhill to the waterfront. I really began to wonder if the harbor would be uphill also!! The rain also paused for our tire dip. For some reason the moment seemed anti-climatic. The journey was so significant that the final moment of dipping the tire in the harbor could not match the profound nature of the whole experience. Celebration came in the form of photos, a hot shower and a great dinner together. 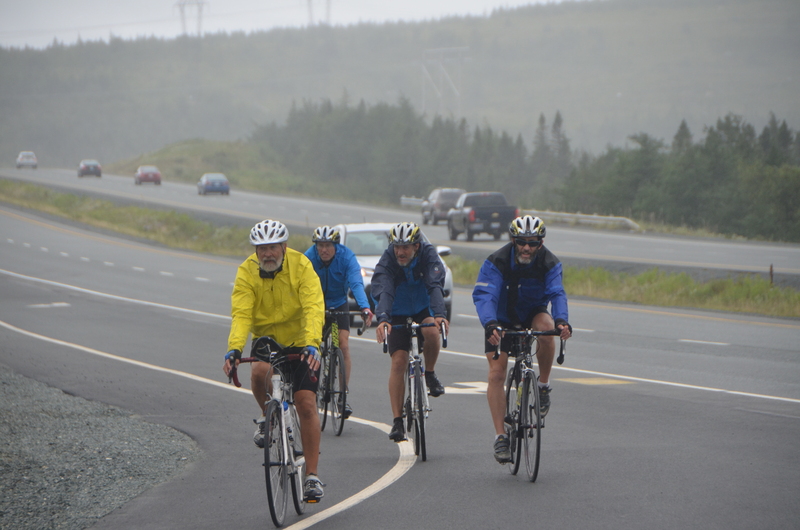 Tomorrow we speak at the Worship Centre and will then cycle to Cape Spear for a few bonus kilometer! It is the most easterly tip of North America. Way to go guys! We will be praying for you as you complete today! Edmonton winters may not look so bad after St John’s summers! Trust you all make back to your homes safely – and in less time and more comfort! Well done everyone, what a tremendous achievement for a good cause. Thank you Mike for the daily Blogs, eagerly awaited. I am sure I was just one of many praying for you every day. Also to Jaquie the driver/manager/unsung heroine. Timo you are excused if you don,t do the Trek, !! You guys completed it, on time. You did an incredible amount of work, physically, mentally, and spiritually. May GOD bless your efforts and multiply your results.